I've been fantasizing recently about future models for David and I to do and one that is really fascinating me at the moment is the Lake Tahoe Summer Colony. 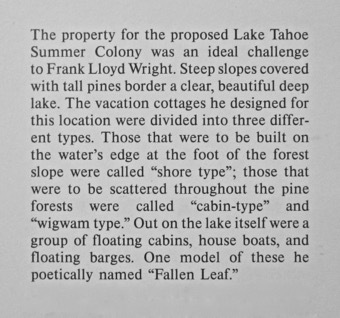 I've got a copy of Frank Lloyd Wright: Designs for an American Landscape 1922-32 which deals rather extensively with it. 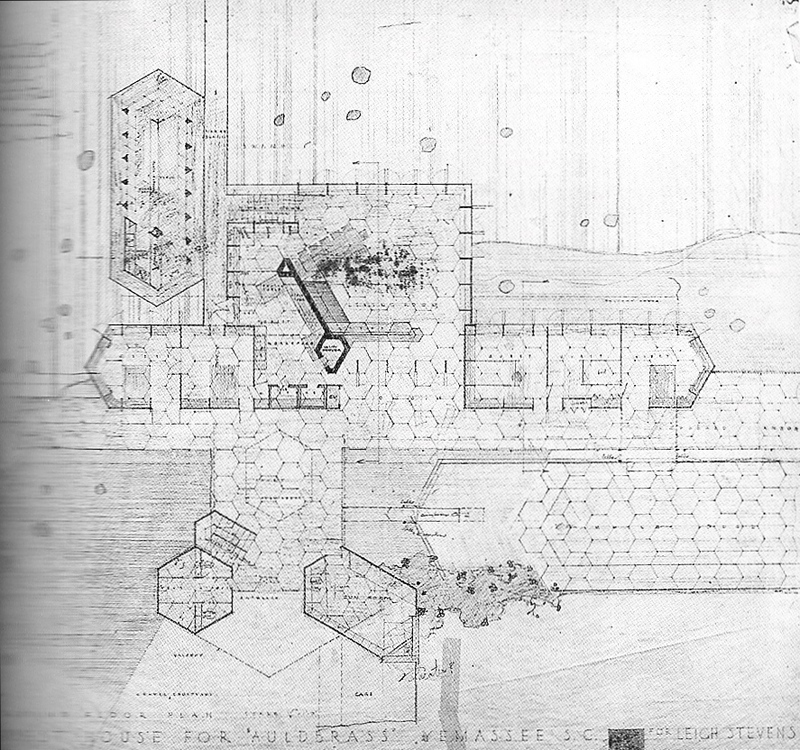 There are many plans and elevations for the various cabins, but most of it seems to be rather rough and on tracing paper. Does anyone know if more finished drawings were produced? I ask because that can be a big factor in being able to make the model. Thanks! couple (?) of cabin types. 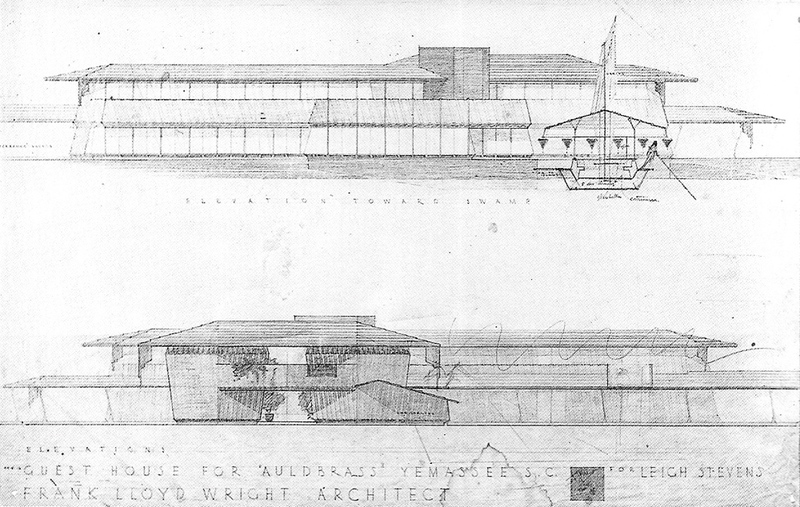 Monograph 4 has much less: a plan drawing and two of the dramatic cabin perspectives, and a sheet with plan and elevation of a "cabin float." I have never seen measured section drawings, plan details, etc, much less CDs of any kind, for this project; no surprise, as the commission was never consummated. What's in Taschen is pretty much the same as what's in the book I mentioned. I was hoping for something that had a higher level of detail (sorry, I did a bad job describing in my first post). I'm not seeing a whole lot with firm dimensions or nice sections through. That doesn't mean it's impossible to make a model of it, just that there would more likely need to be an extra level of interpretation, which is never a good thing and should be avoided as much as possible. Wouldn't it be wonderful to see those barges floating in a lake, lit up at dusk with the sun setting? Yes, it would -- it's a great opportunity (with lots of trees and water for someone [ahem] to model ?) ! You described the problem sufficiently; sadly, there just aren't any working drawings of the project, I believe. Maybe I'm wrong . . . Nevertheless, someone has made a digital model of one of the houses. With our crippled Search function here, at present, I don't know how to find our previous discussion of that one. I think it may be the Fir Tree "cabin" . . . Some time ago, when Joel Silver was apparently more ambitious than he has been lately, he intended to construct one of the barges for his estate at Auldbrass. Perhaps he eventually will do that. SDR, the wonderful David made a model of the E.A. Smith House. Is that what you're referring to? It's extremely similar to some of the cabins for Tahoe. I make no promises about doing Tahoe as a model. David and I have discussed what we want to do next together and there will be a few things before that, but Tahoe is high on my list. The only issue is the lack of detail on the drawings, which can lead to lengthy and serious discussions (like with the Spaulding Print Room). The beauty of it is that it consists of numerous small buildings, so doing one every now and then may be feasible. I'll never forget the first time I saw the rendering for one of the barges. It absolutely took my breath away. Still does, in fact. Roderick, that's an interesting piece of news! Do you have any more information on that? Yes -- of course; that is the model I (mis)remembered . . .
entry; he notes the hex-angled prow and stern as seminal incidents of these angles, there presumably suggested to Wright by the need for some degree of water-worthiness . . .
Wright's much later Auldbrass vessel sports the same hex prow and stern. Oh wow, what a find! Thanks for sharing Rood and PrairieMod! I'd seen black and whites of some of them but it always referred back to the 1920s publication. Fantastic! What modeling program are you using? Sketchup or something more robust? I've always wanted to start some sort of group dedicated to created accurate models of all of Wright's designs. Sketchup. Not sure what you mean by "more robust" though. I'm able to create a high level of detail pretty easily. Do you use something else? I've never tried 3D printing so I can't say. My goal is to make renderings so it works well. Wonderful to see those three drawings at good size, and well photographed, PrairieMod. Has anyone seen this colored perspective view ? The drawing has been published in monotone . . . but could this be the premiere of its colored-pencil version ? The plan is published in Sweeney, "Wright in Hollywood," p 105 -- but at tiny size and in black-and-white. The elevation is previously unpublished -- isn't it ? Wow. Incidentally, I wonder if paper conservationists are able to remove any of the wrinkling from that tracing paper ?